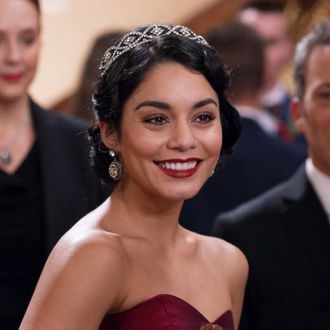 News about Vanessa Hudgens, Netflix, and Christmas should have spelled good things for The Princess Switch sequel, but, alas, the only story today is that Hudgens is set to star in and executive produce a DIFFERENT holiday-themed project for the streaming network. It’s titled The Knight Before Christmas, and per Deadline, the story “follows a gallant English knight who seeks out his true quest after a sorceress inadvertently sends him from the medieval era to present day. While there he soon finds himself falling for a caring high school science teacher who is disillusioned by love.” No word yet on whether Hudgens will play both sorceress and science teacher. Even though Hudgens previously expressed that she would be onboard with The Princess Switch sequel if it happened, it sure looks like she will be too busy to star in two Netflix Christmas movies at once — and that’s not even taking into account the fact that she would have to play two characters in one of those. The Princess Switch is not to be confused with that other Netflix Christmas staple with a similar ring, A Christmas Prince, which Netflix announced last week is getting a third installment and a royal baby. One of Hudgens’s characters in The Princess Switch was actually seen watching A Christmas Prince in the movie, in a bit of a Christmas switch. If you can’t keep it all straight, just watch Hallmark movies instead.